A few days ago I had the privilege to walk the hallowed grounds of the Cambridge American Cemetery with an expert on the history of the U.S. Armed Forces’ staging, presence, and forward operations from Cambridgeshire and southeast England. This gentleman works for the American Battle Monuments Commission, an agency of the U.S. Government that maintains and preserves the 25 overseas cemeteries from the Philippines to Tunisia, from Omaha Beach to the Meuse-Argonne. One cannot visit an overseas U.S. Memorial or Cemetery and not be touched by the stories and sacrifice of these men and women. Although some stories are heroic and some more simple, all were serving their country in a desperate time and found themselves far from their home and their family, and never returned. The historian I was walking with told me the heroic story of Lt. Colonel Vance. 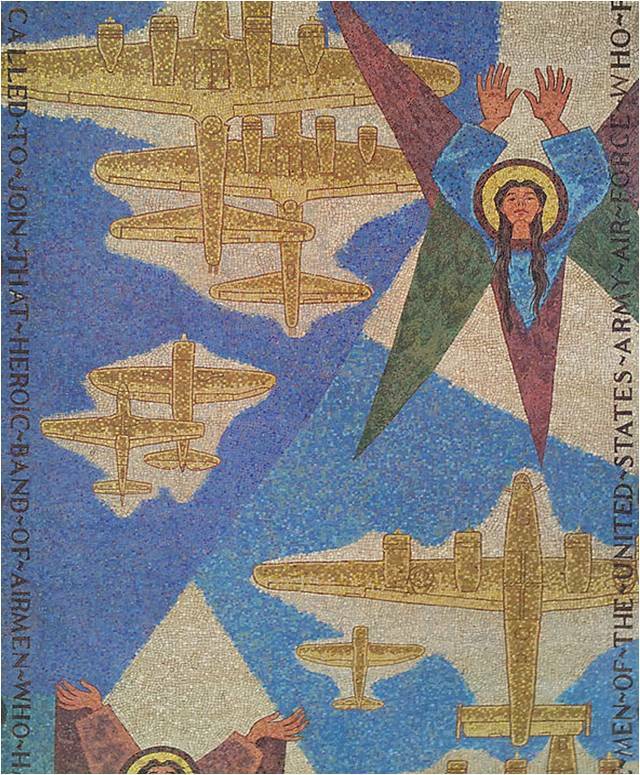 Francis Scott Bradford designed the glorious mosaic that covers the ceiling of the Cambridge American Cemetery Chapel. Ghostly aircraft and mournful angels cover the ceiling in his moving tribute to the 3,811 buried and 5,126 missing who are memorialized at the Cemetery. His story needs to be told. It is the story of an American airman, a 27-year-old Lieutenant Colonel, who had rapidly risen through the ranks in a way that can only happen during a desperate war. Colonel Leon Robert “Bob” Vance, had arrived at West Point in 1935 and graduated in 1939, becoming a young lieutenant as America warily watched the Second World War beginning in Europe. Marrying Georgette Brown the day after his graduation, Bob and Georgette had a daughter in 1942, Sharon, whom he would name his B-24 Liberator after: The Sharon D.
After several years as a flight instructor, he was transferred to England. Lt. Colonel Vance was assigned to the 8th Air Force, 95th Combat Bombardment Wing, 2nd Bomb Division at RAF Helesworth in Suffolk. On 5 June 1944, the day before the allied landings in Normandy, Lt. Colonel Vance led the 489th Bomb Group on a diversionary bombing mission to the Pas-de-Calais to target German coastal defenses as part of the Atlantic Wall. Lt Colonel Vance was in the lead plane as on observer on the flight deck, flying in a pathfinder to ensure the bombs of all the following aircraft hit their target. 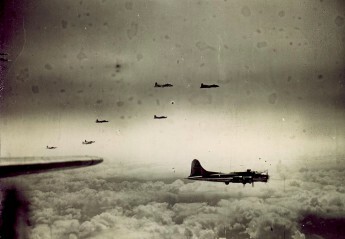 After the short flight to France, the Liberators were over their target when the lead aircraft’s bombs failed to release. Instead of ordering the bombers to drop their ordnance into the Channel, Lt. Colonel Vance ordered all the aircraft to circle and re-approach the target. A photo of LTC Bob Vance, courtesy of the US Army. The photo is in the public domain. On the second approach to the target, the bombers came under intense anti-aircraft fire. Vance’s lead bomber was severely damaged by flak: four crewmen were wounded, three engines disabled, fuel lines ruptured within the aircraft. Despite the damage, the B-24 continued and dropped its bombs over the target although one did not release. Immediately after the bombs were dropped, a flak burst in front of the aircraft that killed the pilot and almost severed Bob’s right foot, trapping him within the bent metal of the mangled cockpit. With only one engine still functioning and severe damage to the airframe, the copilot began to dive the aircraft to maintain airspeed, and Vance, losing blood and suffering from shock, worked the engineering of the aircraft to feather the engines and save the aircraft as one of the crew applied a tourniquet to his foot. Amazingly, the aircraft returned to the English coast and Vance took the controls, ordering the men to bail out. Knowing it was impossible to land the aircraft, he aimed to get the crew safely away. As the crew departed, he discovered that not only was he trapped, but in the confusion thought that one of the crewmembers was also trapped and unable to bail out. He decided the only option was to ditch the B-24 in the Channel — the B-24 was a notoriously difficult aircraft to safely ditch in water. Stuck in a prone position between the pilot and co-pilots’ seats, trapped in the mangled cockpit and losing blood, Lt. Colonel Vance could only see out the side window of the cockpit and could only access some of the plane’s controls. Remarkably, he landed the aircraft safely in the water, believing that the other crewmember would have a fighting chance to live. As the water flooded into the cockpit — Vance was still trapped — he had a slim hope that air-sea rescue might reach the aircraft before it sank. However, the one bomb that had failed to release but was still armed detonated at this moment, blowing the B-24 to pieces and amazingly sending Vance flying through the air, now dislodged from the metal. He hit the water and was just able to inflate his life vest, clinging to consciousness and life. In a moment of self-sacrifice that is difficult to believe, Vance then spent the next 50 minutes searching for his last crewmember in the sinking debris of the B-24 before he was rescued by the RAF. Colonel Vance had survived the ordeal, but tragically was lost at sea two months later as the C-54 Skymaster carrying him on a medical evacuation flight back to the United States disappeared between Iceland and Newfoundland. On 4 January 1945 it was announced that Lieutenant Colonel Vance would receive the Medal of Honor posthumously, but the presentation was delayed until 11 October 1946, so that his daughter Sharon — whom he had named his B-24 after — could be awarded her father’s medal. 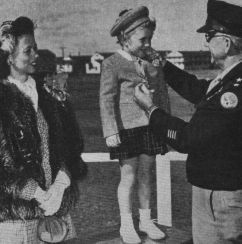 5-year-old Sharon Vance is presented with her father’s Medal of Honor in 1946. US Army Photograph. For conspicuous gallantry and intrepidity above and beyond the call of duty on 5 June 1944, when he led a Heavy Bombardment Group, in an attack against defended enemy coastal positions in the vicinity of Wimereaux, France. Approaching the target, his aircraft was hit repeatedly by antiaircraft fire which seriously crippled the ship, killed the pilot, and wounded several members of the crew, including Lt. Col. Vance, whose right foot was practically severed. In spite of his injury, and with 3 engines lost to the flak, he led his formation over the target, bombing it successfully. After applying a tourniquet to his leg with the aid of the radar operator, Lt. Col. Vance, realizing that the ship was approaching a stall altitude with the 1 remaining engine failing, struggled to a semi-upright position beside the copilot and took over control of the ship. Cutting the power and feathering the last engine he put the aircraft in glide sufficiently steep to maintain his airspeed. Gradually losing altitude, he at last reached the English coast, whereupon he ordered all members of the crew to bail out as he knew they would all safely make land. But he received a message over the interphone system which led him to believe 1 of the crewmembers was unable to jump due to injuries; so he made the decision to ditch the ship in the channel, thereby giving this man a chance for life. To add further to the danger of ditching the ship in his crippled condition, there was a 500-pound bomb hung up in the bomb bay. Unable to climb into the seat vacated by the copilot, since his foot, hanging on to his leg by a few tendons, had become lodged behind the copilot’s seat, he nevertheless made a successful ditching while lying on the floor using only aileron and elevators for control and the side window of the cockpit for visual reference. On coming to rest in the water the aircraft commenced to sink rapidly with Lt. Col. Vance pinned in the cockpit by the upper turret which had crashed in during the landing. As it was settling beneath the waves an explosion occurred which threw Lt. Col. Vance clear of the wreckage. After clinging to a piece of floating wreckage until he could muster enough strength to inflate his life vest he began searching for the crewmember whom he believed to be aboard. Failing to find anyone he began swimming and was found approximately 50 minutes later by an Air-Sea Rescue craft. By his extraordinary flying skill and gallant leadership, despite his grave injury, Lt. Col. Vance led his formation to a successful bombing of the assigned target and returned the crew to a point where they could bail out with safety. His gallant and valorous decision to ditch the aircraft in order to give the crewmember he believed to be aboard a chance for life exemplifies the highest traditions of the U.S. Armed Forces.